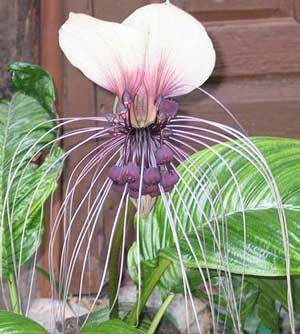 This is Tacca nivea, also known as White Bat Flower, Bat Head Lily, and Devils Whiskers. This plant likes to be in the shade with no direct sunlight and it needs high humidity so you can use a rock tray to have standing water around the base of this plant, but not touching the pot itself or getting into the mix. We just want more water in the air around this plant. The bloom is extraordinary with the giant white blossoms shading a group of dangling seed pods, and then the cats whiskers get to be about 2 feet long on a mature plant. Not only does this have a spectacular bloom, but the large deeply veined leaves are also impressive. USDA Hardiness Zones 10 to 11. 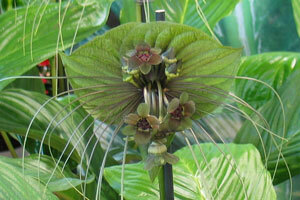 This is Tacca chantrieri Green. 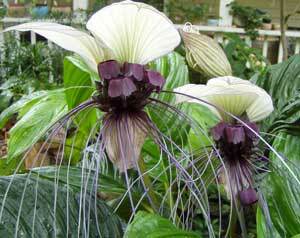 This amazing bat plant has green blossoms with long showy whiskers. 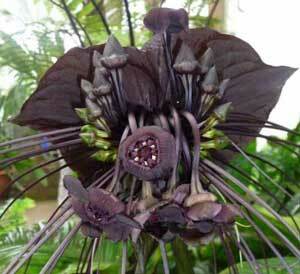 It is the same species as the black bat plant but this bright blossom is quite the spectacle. This rare plant will stop passers by in their tracks. 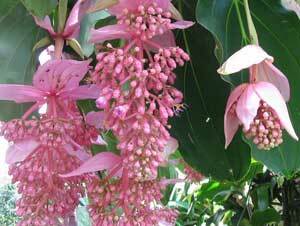 This breath taking tropical blooms from late Spring to early Fall and like to live in a spot where it gets about 60 percent shade. This plant is a good choice as an indoor potted plant since it does well in containers and in semi shade. They like to drink a great deal of water and bask in high humidity. USDA Hardiness Zones 10 to 11.